We arrived in the car park and spent 5 minutes admiring the amazing view of Kerrera and Mull. Well admiring the view and staying out the freezing cold !! The initial omens didn’t exactly fill us with confidence for a nice, flat Troon type seaside parkrun. We headed up to join the throng when we noticed the first sign.. surely that’s some sort of Oban Halloween joke.. right? 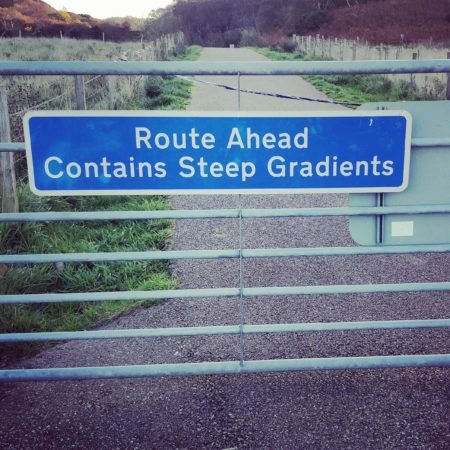 I mean how steep would a route have to be before it warranted its own warning sign? The sign wasn’t the only demonic apparition to scare the soul and chill the bones. 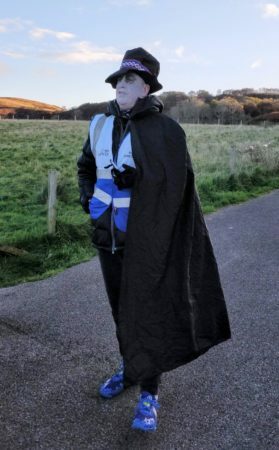 This was parkrun’s Halloween weekend and many of the competitors and volunteers had entered into the spirit of things. Not us alas, we didn’t get the memo. The demonic apparition that was race director Derek gave the usual runners briefing before we set off. We loved the additional instructions like keeping your werewolf on a short lead and your goblins within arms reach. Attentively, we listened to the description of the route too, and we both nodded as we were told to go from the start, past Marshall 2 and Marshall 3 to Marshall 1, where we run round and head back past Marshall 3 again until we get to Marshall 2.. then..
Yeah, we looked at each other with one of those “not understanding but not wanting to look thick” looks. We were sure it would make sense once we hit the trail. The race sets off up a great wee tarmac track into the Ganavan Sands hinterland. Not far from the start there’s another sign. This time, it’s a big red one. And they’re not bloody joking. Now in the GinRunners it’s fair to say we have varying degrees of love for hills. This one, although “quite” steep doesn’t go on for very long and you soon (or, not so soon) reach the top and head across nicely undulating open moorland. Nicely undulating… as in hilly. We’ve ran some pretty park runs this year, but this has to be one of the best. The weather helped, with stunning views over blue seas to a snow dusted Torosay on the Isle of Mull and beyond. The first section of the run takes you past the two “turn” marshals to the end of the path where you spin round and head back for the start. You head about 3/4 of the way back before turning round again to complete the extra loop. The section you run twice “undulates” quite a bit, but by the time you make it to the last turn you know it’s only one more climb before it’s downhill all the way to the finish. Actually the hill down to the timekeepers is almost as hard going down as it is going up. As Derek put it, you just have to go for it and hope your quads hold up. I’m not sure where my quads are, so I just nodded sagely. His other option was to run down like Phoebe from Friends. I wish I’d known that was an option, I would have flapped my arms around and possibly screamed too. 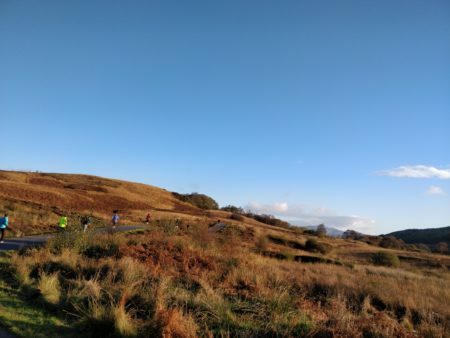 If the hills, the views and the scenery don’t put Ganavan Sands parkrun near the top of your “must do” list, then the sheer friendliness and social aspect should. Because the course has three turning points on it you’re constantly meeting either slower or faster runners coming the opposite direction. I think almost everyone said hello in passing and the support and encouragement from your fellow competitors makes a huge difference. 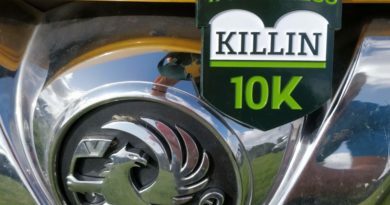 Another thing we loved about the Ganavan Sands parkrun was that there truly were “all abilities” there. The usual fast folk shot off into the distance but there were also a load of people walking the 5K and families with small children taking part too. 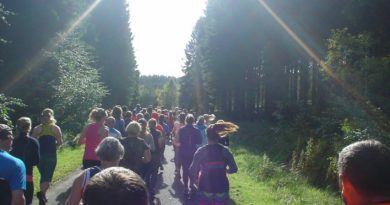 We chatted to the Doreen, the driving force behind getting the event set up, and she was pleased just how wide a spectrum of the parkrun faithful the race attracted. You’re never going to get a PB here, so you may as well just go out and enjoy it. We did, and we’ll be going back. 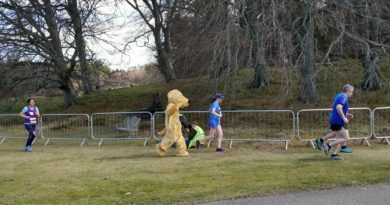 With the parkrun ticked off we headed back to Mabel before driving into Oban for the second event of the day. 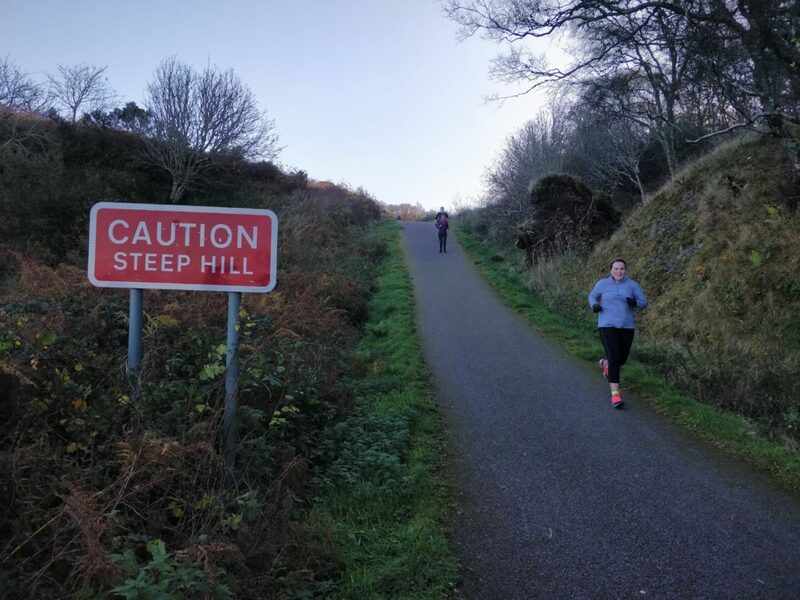 Would you believe, by pure chance, there was a gin festival on in the Corran Halls..
← Drumchapel parkrun : Down, Up, Up, Repeat.